Quick Quiz! Where might you hear the following conversation? ... Waitress: "What would you like to drink, honey?" Customer: "I'll have a coke." Waitress: "What kind?" Customer: "Diet Pepsi." If you answered somewhere between Texas and Georgia, you would be correct! 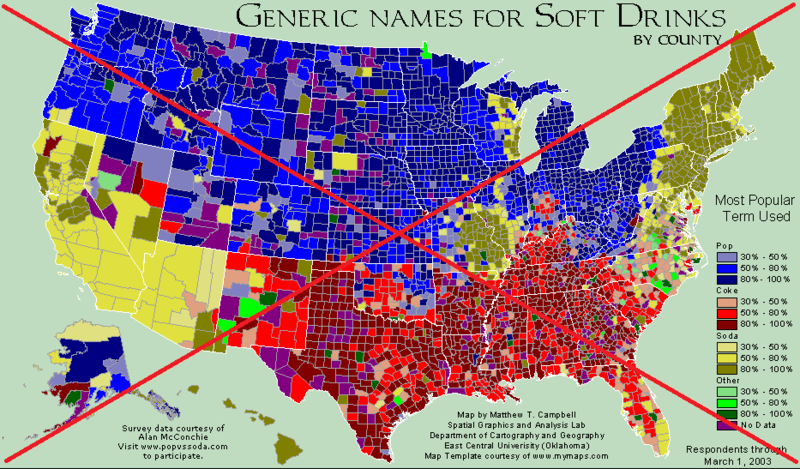 To those of us not from that area, it sounds crazy/confusing that they call all soft drinks a "coke" (even if they're not a Coca-Cola coke). But, of course, people from that area might have similar thoughts when they hear someone call it a "pop" or a "soda". In order to be a savvy traveler, or impress your linguist friends, this is a topic you need to master. And what better way to get a grasp on this topic than to plot the data on a map! One such map was shared by many news sites such as NPR a few years ago. 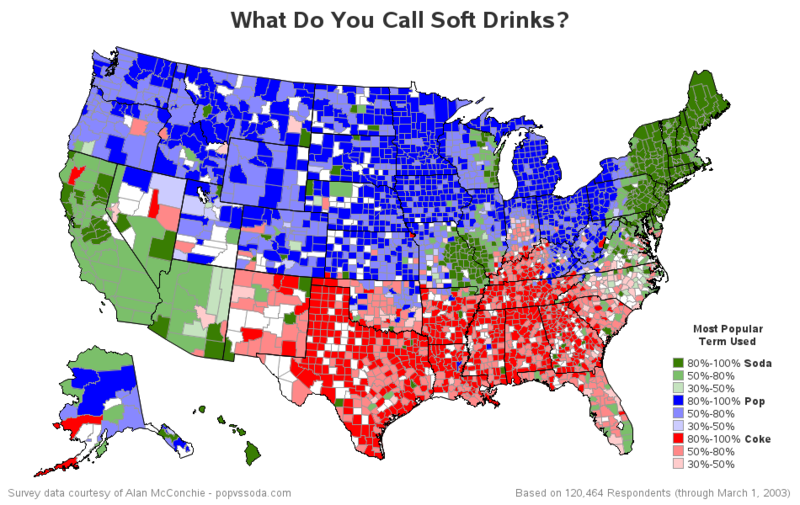 It was a very interesting map, and after studying it, I found that certain regions of the country had fairly strong preferences for calling soft drinks by different names. And North Carolina, where I live, was a bit of a mixed-bag when it comes to preferences ... which is probably why I was familiar with all the names. Although the map was interesting, there were several problems (or opportunities for improvement) that jumped out at me. The green background was similar to some of the gradient shades used in the map. The purple color used for "No Data" was very similar to the dark blue used for "80-100% pop", and was causing some visual deception in the Great Plains states (such as North Dakota through Kansas). The legend was sorted such that the smallest values were at the top, and the largest ones were at the bottom (which isn't as intuitive as the other way around). The map was a static image, with no mouse-over text, so it was impossible to see the exact values for each county. There were too many colors to mentally grasp and keep track of. And in general, the map seemed 'busy'. In general, I think my map is less cluttered, and easier to quickly understand. Below is a list of specific changes I made. Eliminated the legend color for 'Other' and 'No Data'. Sorted the legend such that the maximum %s are at the top. Eliminated some text, and made the footnotes a lighter gray color. Also, if you click the image above, you can see the interactive version, with mouse-over text for each county, so you can see the county name and data details. What do you call soft drinks where you live? Do you use one of the main three names in this map, or some other name? And ... what's your favorite soft drink? - My favorite is "Inca Cola" (made with the recipe they use in Peru, with real sugar, etc - that's the best!). Hey ... no mention of CHEERWINE ( https://www.eater.com/2017/3/23/14950304/cheerwine-history ). Remember sharing a case with me a while back? I'm amazed that my hometown Boston, MA area (Middlesex county) is 30% "Other" (easy to find by drilling down on the map, nice!). Ahh - I give you bonus points for noticing the drilldown capability! I grew up saying "pop" (one of those dark blue counties in the Great Plains). Then I went to college in one of the dark green counties in the Northeast and changed my language to avoid laughter. So now I'm a "soda" girl living in a light-red county in the South. Calling it all "Coke" is just a big no. My favorite *soda* is any Creme Soda [see! it's right in the name!] that's made with real sugar. Soda - and Vernor’s ginger ale on the rare occasions I drink soda.